Sri Lanka piled on the runs against India on day two of the second Test, with Kumar Sangakkara leading the way, in Colombo, on Tuesday. Their captain helped himself to three successive boundaries in Abhimanyu Mithun's third over -- the fifth of the day, the second of which helped him go past the 150-run mark. It was the 12th occasion that Sangakkara made 150-plus in an innings, thereby joining his former captain and Mahela Jayawardene as the only two Lankan batsmen to achieve the feat. Chasing Sri Lanka's huge total of 642 for four declared, India got off to a good start and ended day two on 95 for no loss. Virender Sehwag was unbeaten on a well-made 64, with Murali Vijay on 22. Sangakkara struck his career's seventh double century as Sri Lanka continued to toy with a listless Indian bowling attack to amass 457 for two at lunch. 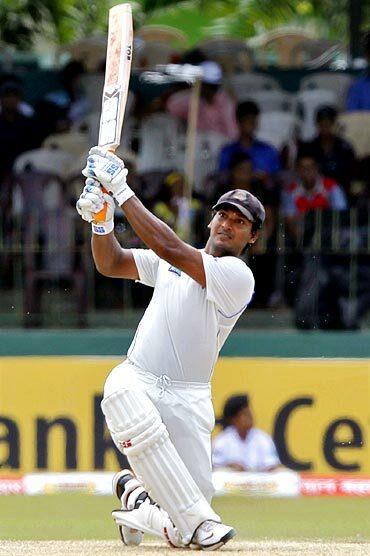 Sangakkara's seventh double century came in 301 balls, with 27 hits to the boundary. The fact that 400 runs for Sri Lanka came in a record 435 minutes and 651 balls testified to a placid pitch and some lacklustre bowling by the Indians. 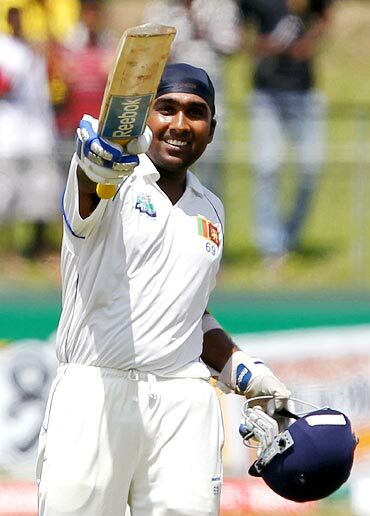 Mahela Jayawardene also took no time to get his eye in and matched Sangakkara stroke for stroke. The 100 runs partnership for the third wicket between the two came off 188 balls. 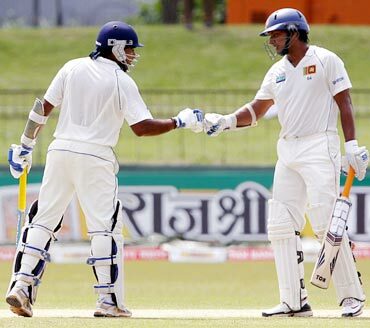 This was the 12th 100-run partnership between Sangakkara and Jayawardene in Test cricket. 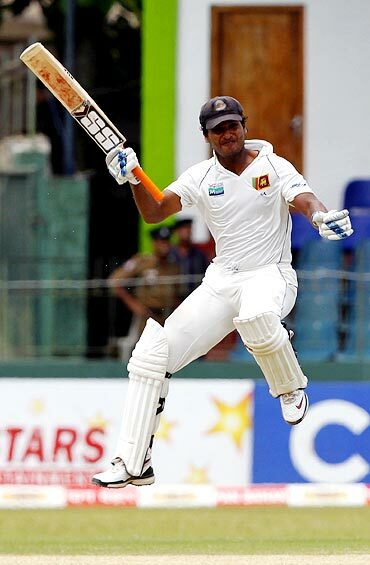 The former Sri Lanka captain completed his half-century in 100 balls and struck seven boundaries in the course of it. 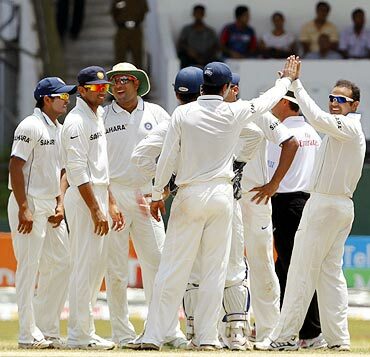 Virender Sehwag brought some relief to the Indian camp with the big wicket of Sangakkara. Rahul Dravid completed a sharp catch at first slip to send back the Sri Lankan captain for a splendid innings of 219, laced with 29 boundaries in 335 balls. Sangakkara put on 193 runs for the third wicket with Jayawardene with neither batsmen offering India's fielders a single chance throughout their fluent partnership. Jayawardene ensured Sri Lanka didn't lose the momentum after Sangakkara's departure as he milked the bowlers around with ease. His 178-ball ton came in 251 minutes and was studded with 12 boundaries. It was the former captain's 19th ton at home and his sixth against India. It also helped him break the legendary Sir Don Bradman's record of most centuries at a venue. Jayawardene now has 10 Test tons at the SSC, one more than the Don's nine at the MCG. Jayawardene was finally dismissed for 174, caught at short midwicket by Suresh Raina, giving Harbhajan Singh his first wicket of the series. The home team eventually declared at 642 for four in 159.4 overs, with Thilan Samaraweera remaining unbeaten on 76.